How “big” should government be?, by António Afonso & Ludger Schuknecht. EconPol Working Papers 23, March 2019. A new working paper from the European Network for Economic and Fiscal Policy Research (EconPol Europe) links the recent findings of Data Envelope Analysis on public expenditure to the size of government. 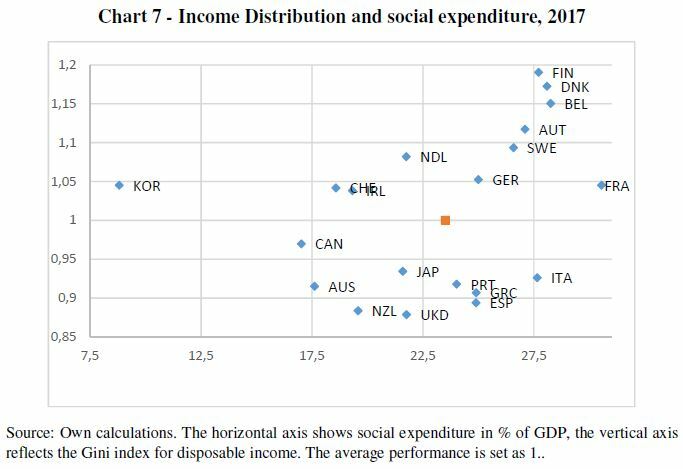 Through analysis of government performance indicators in relation to public expenditure, the authors find the biggest expenditure categories have the highest savings potential, with the ‘optimal’ spend for governments in advanced economies at 35% of GDP. The findings, the authors consider, suggest that many countries would benefit from smaller government, and that countries should pursue forms of institutions and policies to achieve savings. However, they also warn that population aging and financial instability are important fiscal risks, notably for short- and long-term fiscal sustainability, that are certain or likely to materialise and raise public expenditure even further in the future. ‘Naturally, on which policies and sectors public money is going to be spent is a decision linked to the choices of citizens and taxpayers’, Afonso & Schuknecht conclude. EconPol Europe is a network of 14 policy-oriented university and non-university research institutes across 12 countries, who contribute scientific expertise to the discussion of the future design of the European Union.